Parathyroid carcinoma (PC) is a very rare malignancy with a high tendency to recur locally, and recurrent disease is difficult to eradicate. In most western European countries and United States, these malignant neoplasms cause less than 1% of the cases with primary hyperparathyroidism, whereas incidence as high as 5% have been reported from Italy, Japan, and India. The molecular etiology of PC is poorly understood. The APC (adenomatous polyposis coli) tumor suppressor gene was inactivated by DNA methylation in five analyzed PCs, as determined by RT-PCR, Western blotting, and quantitative bisulfite pyrosequencing analyses. This was accompanied by accumulation of stabilized active nonphosphorylated β-catenin, strongly suggesting aberrant activation of the WNT/β-catenin signaling pathway in these tumors. Treatment of a primary PC cell culture with the DNA hypomethylating agent 5-aza-2'-deoxycytidine (decitabine, Dacogen(r)) induced APC expression, reduced active nonphosphorylated β-catenin, inhibited cell growth, and caused apoptosis. Aberrant WNT/β-catenin signaling by lost expression and DNA methylation of APC, and accumulation of active nonphosphorylated β-catenin was observed in the analyzed PCs. We suggest that adjuvant epigenetic therapy should be considered as an additional option in the treatment of patients with recurrent or metastatic parathyroid carcinoma. Parathyroid carcinoma (PC) is a rare cause of primary hyperparathyroidism with characteristic marked hypercalcemia and highly elevated parathyroid hormone levels. In most western European countries and United States, these malignant neoplasms cause less then 1% of the cases, whereas incidence as high as 5% have been reported from Italy, Japan, and India [1–4]. The incidence in the United States has more than doubled since 1988 . PCs are slow-growing with a high tendency to recur locally (30%-50%), and recurrent disease is difficult to eradicate [6–8]. An overall 5-year survival rate of 86% and a 10-year survival rate of 49% have been observed in a report that described 286 cases of PC in the United States . Loss of heterozygocity analyses have shown a higher fractional allelic loss in PCs than in parathyroid adenomas, where frequently deleted regions included the PTEN, RB, HRAS, p53, MEN1, and HRPT2 genes [10, 11]. Somatic MEN1 mutations were recently described in 3 of 23 (13%) PCs, suggesting a role in the development of these tumors . Overexpression of the cyclin D1 oncogene (CCND1) has been observed in 10 of 11 (91%) PC specimens . Carriers of the hyperparathyroidism-jaw tumor (HPT-JT) syndrome show a higher risk of developing PC; 10% to 15% of affected individuals present with malignant parathyroid tumors . Somatic mutations of HRPT2 (parafibromin), the gene responsible for HPT-JT syndrome , occur in PC with an estimated odds ratio of 45.2 (95% CI: 12.8-160.0%) as calculated from a compilation of six published studies. The HRPT2 mutation frequency in sporadic parathyroid adenoma was calculated to 1.8% . Negative immunostaining for parafibromin has been suggested as a means to diagnose PC, if the rare commonly cystic adenomas of the HPT-JT syndrome are excluded [16, 17]. Recently, it was suggested that this may have some limited validity and cannot replace HRPT2 mutation analysis . Positive immunostaining for PGP9.5 (UCHL1) as well as absent staining for the adenomatous polyposis coli (APC) tumor suppressor have been suggested recently as additional markers for parathyroid malignancy [19, 20]. Inactivation of APC by mutation with subsequent stabilization of β-catenin has been strongly implicated in the cause of approximately 80% of colorectal cancers [21–24]. APC function can also be impaired by reduced expression through hypermethylation of the APC 1A promoter, a phenomenon observed in several malignances [25–29]. In the present study, we show that absent or markedly reduced expression of APC in five analyzed PCs is caused by hypermethylation of the APC promoter 1A. We also show that this was accompanied by accumulation of stabilized active nonphosphorylated β-catenin, strongly suggesting aberrant activation of the WNT/β-catenin signaling pathway in these tumors. Treatment of a primary PC cell culture with the DNA hypomethylating agent 5-aza-2'-deoxycytidine induced APC expression, reduced active nonphosphorylated β-catenin, inhibited cell growth, and caused apoptosis. 5-aza-2'-deoxycytidine (decitabine; Dacogen; MGI Pharma, Bloomington, MN) was recently approved by the United States Food and Drug Administration for the treatment of myelodysplastic syndrome [30, 31]. We suggest that epigenetic therapy should be considered as an additional option in the treatment of patients with recurrent or metastatic parathyroid carcinoma. Tissue specimens were acquired from patients diagnosed and operated on in the clinical routine at Uppsala University Hospital and Martin-Luther-University of Halle-Wittenberg. The tissue was intraoperatively snap frozen. Normal parathyroid tissue was obtained from glands inadvertently removed in conjunction with thyroid surgery where autotransplantation was not required (n = 1) or as normal parathyroid gland biopsies in patients subjected to parathyroidectomy (n = 7). The diagnosis of parathyroid carcinoma (n = 5) was unequivocal due to occurrence of distant metastases at diagnosis or follow-up. Clinical characteristics of four PC patients have been published . Written informed consent was obtained from the patients and approval was obtained from the local ethical committee, Uppsala. DNA was prepared from cryosections using QIAamp(r) DNA Mini Kit (Qiagen) and total RNA using TriZol Reagent (Gibco BRL, Life Technologies Inc.), according to the manufacturer's instructions. DNA-free RNA was prepared using the Nucleospin RNA II kit (Macherey-Nagel GmbH & Co. KG). Reverse transcription of RNA was performed with random hexamer primers using the First-Strand cDNA Synthesis kit (GE Healthcare) according to the manufacturer's instructions. RT-PCR of APC was performed using the forward primer 5'-gccagctcctgttgaacatcagat (exon 11) and the reverse primer 5-gcccatacatttcacagtccactt (exon 12). The PCR resulted in a 150 base pair fragment. Primers for GAPDH were as described previously . Quantitative real-time PCR was performed on StepOnePlus™ Real-Time PCR systems (Applied Biosystems, Foster City, CA) using assays for APC (Hs 01568270_m1) and GAPDH (Hs99999905_m1). Each cDNA sample was analyzed in triplicate. Standard curves were established by amplifying a purified PCR fragment covering the sites for probes and primers. Frozen tissue sections were stained as described  using an anti-APC mouse monoclonal antibody with an epitope mapping at the N-terminus (Santa Cruz Biotechnology, INC., Santa Cruz, CA; catalog no. sc-9998). All APC coding exons 2-15 with intron/exon junctions were directly sequenced on the 3130xl Genetic Analyzer using the Big Dye(r) terminator v1.1 cycle sequencing kit (Applied Biosystems, Foster City, CA). PCR primers for exon 10 and exon 14 , and the additional ones  were as published. The known C/T (exon 12; position 14577867) and G/A polymorphisms (exon 14; position 14579574) were found in three and five of the analyzed PCs, respectively. No mutations were observed. DNA was converted using the EpiTect Bisulfite Kit and PCR amplified using the HotStarTaq Plus Master Mix Kit (Qiagen). The APC assay used is available at the PyroMark Assay Database (Qiagen). Pyrosequencing [36–38] was done with the PyroMark™ Q24 system (Qiagen). All samples were analyzed in triplicates (Additional file 1: Table S1). Western blotting analyses were done on extracts prepared in Cytobuster Protein Extract Reagent (Novagen Inc., Madison, Wisconsin, USA) or RIPA buffer supplemented with Complete protease inhibitor cocktail (Roche Diagnostics GmbH, Mannheim, Germany). Anti-β-catenin goat polyclonal antibody (Santa Cruz Biotechnology Inc., Santa Cruz, USA, # sc-1496), anti-active-β-catenin  (Upstate, Lake Placid, USA, # 05-665), anti-APC rabbit polyclonal antibody (Santa Cruz Biotechnology Inc., Santa Cruz, USA, # sc-896), and anti-β-tubulin polyclonal antibody (Santa Cruz Biotechnology Inc.) were used. After incubation with the appropriate secondary antibodies, bands were visualized using the enhanced chemiluminescence system (GE Healthcare Europe GmbH, Uppsala, Sweden). Parathyroid carcinoma cells (PC1) were prepared directly after operation according to published procedures . Collagenase digestion was for 1 hour. Cells (2×105) were distributed onto 35-mm dishes in DMEM/10% fetal bovine serum (Sigma) and incubated in triplicates with 5 μM 5-aza-2'-deoxycytidine (Sigma-Aldrich). Fresh 5-aza-2'-deoxycytidine was added every 24 hrs. Cells were harvested after 24 hrs and 48 hrs for RNA and protein extraction. Cell viability was measured on PC1 cells distributed in triplicates (2×104) onto 96 well plates using the cell proliferation reagent WST-1 (Roche Diagnostics GmbH, Mannheim, Germany). Quantification of cytoplasmic histone-associated-DNA-fragments (mono- and oligonucleosomes) was done using the Cell Death Detection ELISA PLUS kit (Roche Diagnostics). Camptothecin at 0.1 μg/ml was used as positive control of apoptosis. Unpaired t test was used. Values are presented as arithmetical mean ± SEM. A p value of < 0.05 was considered significant. In order to determine whether expression of APC was perturbed in the five PC specimens, RT-PCR analysis was performed. The results showed that APC mRNA expression was undetectable to very low in the PCs when compared to parathyroid adenomas or normal parathyroid tissue specimens (Figure 1A). In agreement, APC protein expression was undetectable in the five PCs as revealed by Western blotting analysis (Figure 1B) and immunohistochemistry (data not shown). Gene inactivation or reduced expression could be caused by various mechanisms, including promoter hypermethylation. We used bisulfite pyrosequencing to quantitatively determine the methylation level for ten CpGs of the APC promoter 1A (Figure 2; Additional file 1, Table S1). The mean methylation levels (%) of all CpGs were significantly higher in the five PCs (48%-88%) than in the eight normal parathyroid tissue specimens (10%-18%). It is conceivable that the increased methylation level of the APC promoter caused the prominent reduction in gene expression. This was further supported by in vitro cell culturing experiments (Figure 3). Treatment of cultured primary cells from parathyroid carcinoma no. 1 (PC1) with the DNA methylation inhibitor 5-aza-2'-deoxycytidine (decitabine, Dacogen(r)) resulted in apparent induction of APC mRNA and protein expression, and as expected  also in reduced cell viability and apoptosis (Figure 3A-D). Thus, a mean APC methylation level of 48% (PC1; Additional file 1, Table S1) seemed sufficient for "gene inactivation". We note that this is in agreement with a recent report on a number of hypermethylated genes in colon cancer where methylation levels in excess of 40% were found to be incompatible with transcription . We also performed DNA sequencing analysis of all APC exons and intron/exon splice junctions in the five PCs, with no detected mutations (data not shown). Expression of APC mRNA and protein. 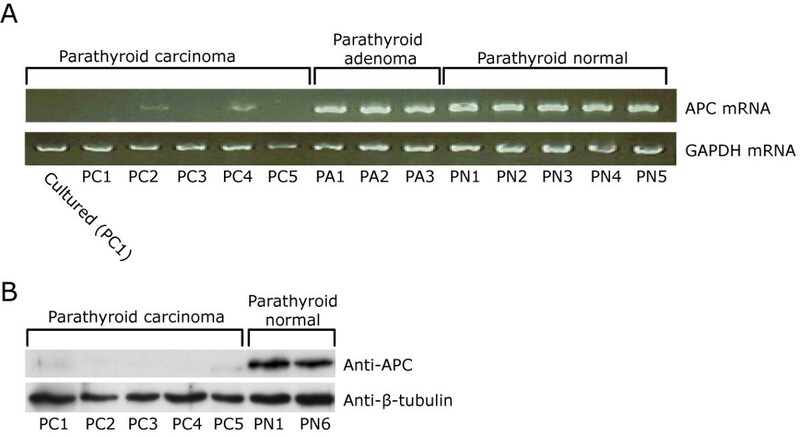 A, RT-PCR analysis of parathyroid carcinomas (PC1-5), parathyroid adenomas (PA1-3), and normal parathyroid tissue specimens (PN1-5). B, Western blotting analysis of APC. DNA methylation analysis by quantitative bisulfite pyrosequencing. Parathyroid carcinomas (in red; n = 5) and normal parathyroid tissue specimens (in blue; n = 8). Methylation levels were determined for ten CpGs of the APC promoter 1A, in triplicates. See Additional file 1, Table S1 for all measurements. Effects of 5 μM 5-aza-2'-deoxycytidine (Aza) on in vitro cultured primary parathyroid carcinoma cells (PC1). A, APC/GAPDH mRNA expression ratio as determined by real-time quantitative RT-PCR analysis. B, Western blotting analysis of APC. Coomassie blue-stained filter is shown as loading control. C, cell viability. D, apoptosis. Camptothecin at 0.1 μg/ml was used as positive control. Mutation or vanished expression of APC may lead to aberrant activation of the WNT/β-catenin signaling pathway, through the accumulation of stabilized active nonphosphorylated β-catenin [21–24]. Western blotting analyses with antibodies to total β-catenin or to active nonphosphorylated β-catenin  showed almost similar relative protein levels in the five PCs (Figure 4A; B). On the contrary, in normal parathyroid tissue specimens (Figure 4B) the expression level of active nonphosphorylated β-catenin was lower than the total β-catenin level, and much lower than in the parathyroid carcinomas. These results strongly suggest the presence of accumulated active nonphosphorylated β-catenin in the analyzed PCs. Among its many functions APC controls the level of β-catenin [21–24]. We reasoned that if the strongly reduced expression of APC (Figure 1A-B) caused accumulation of active β-catenin, then re-expression of APC in cultured primary PC1 cells by treatment with the general demethylating agent 5-aza-2'-deoxycytidine (Figure 3A-B) should lead to a reduced active β-catenin level. A reduced active β-catenin level was observed (Figure 4C). This result is consistent with the normal role for APC in regulating the β-catenin level. Western blotting analysis of total β-catenin (Anti-β-catenin) and active nonphosphorylated β-catenin (Anti-active β-catenin). A, the five parathyroid carcinomas. Mean methylation levels (Additional file 1, Table S1) of the APC promoter 1A are also shown. B, normal parathyroid tissue specimens (n = 5). C, active β-catenin level in cultured primary PC1 cells treated with 5-aza-2'-deoxycytidine for the indicated time points. For all five analyzed PCs, our results strongly suggest inactivation of APC by DNA methylation and consequential aberrant WNT/β-catenin signaling by the accumulation of active nonphosphorylated β-catenin. Treatment in vitro with the hypomethylating agent 5-aza-2'-deoxycytidine inhibited PC cell growth and induced apoptosis, raising hopes for adjuvant therapy. A recent study demonstrated negative immunohistochemical staining for APC in nine of twelve PCs , supporting a frequent inactivation of APC in PCs. The only treatment of PC with higher rate of cure is diagnosis before or during operation followed by complete removal of the tumor. Treatments of recurrent or metastatic disease have been difficult to evaluate due to the uncommonness of the tumor entity, but in one study adjuvant radiotherapy was shown to improve survival . 5-aza-2'-deoxycytidine (decitabine; Dacogen; MGI Pharma, Bloomington, MN) was recently approved by the United States Food and Drug Administration for the treatment of myelodysplastic syndrome [30, 31]. 5-aza-2'-deoxycytidine has been shown to suppress tumorigenecity of xenografted cells from solid tumors [41, 44–46]. Although its efficacy in solid tumors remains to be fully evaluated [31, 47], we suggest that Dacogen(r) should be taken under consideration for additional treatment of recurrent or metastatic PC, a life threatening condition which has been notoriously difficult to eradicate. The WNT/β-catenin signaling pathway was aberrantly activated in the analyzed parathyroid carcinomas, due to lost expression of APC likely caused by promoter DNA methylation. APC was reactivated in vitro by 5-aza-2'-deoxycytidine and adjuvant epigenetic therapy (decitabine; Dacogen; MGI Pharma, Bloomington, MN) should be considered as an additional option in the treatment of patients with recurrent or metastatic parathyroid carcinoma. This work was supported by the Swedish Research Council, Swedish Cancer Society, and Lions Fund for Cancer Research. JS performed experiments, analyzed data, performed statistical analysis, and helped to draft the manuscript. MA performed experiments, MS analyzed data and helped to draft the manuscript. HD contributed with material and helped to draft the manuscript. GÅ helped to draft the manuscript. PB performed experiments, analyzed data, performed statistical analysis, and helped to draft the manuscript. GW conceived of the study, participated in its design and coordination and drafted the manuscript. All authors read and approved the final manuscript.